Competitive swimming can start as young as 4 years of age in many recreational leagues. It typically ends at age 18, when swimmers are eligible for masters programs and college teams. Puberty can have a significant impact on a swimmer's training, development and focus, and create an imbalance in abilities of swimmers who are the same age but developing at a different pace. As a swimmer matures through puberty, swim training moves from a general focus to a more specialized focus. 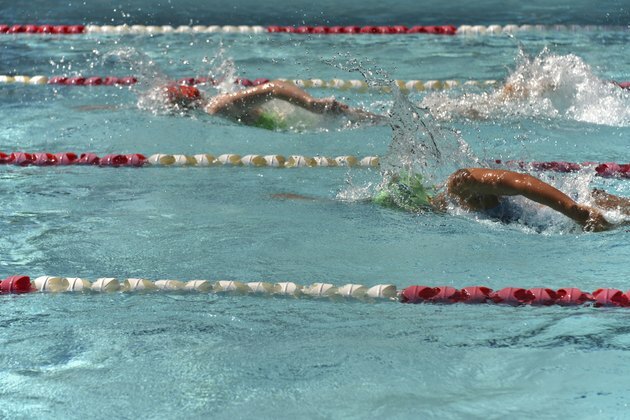 Up until about age 11 or 12, most swimmers focus on all strokes and building technical skill in the water. Puberty hits just at the time when swimmers typically increase the level of their training and determine how committed they are to competitive swimming. A teen swimmer begins to focus on specializing in a few events, increasing and adjusting training, especially toward the end of puberty when they are developmentally ready to determine their primary focus. As a swimmer, you may find that your body changes as you experience growth spurts, especially between the ages of 11 and 14. You may have sudden bursts of speed followed by lengthy plateaus. This is completely normal -- part of your technical skill is keeping pace with your body's growth. You may feel awkward and uncoordinated, and self conscious about appearing in a revealing swimsuit. USA Swimming points out that girls typically hit their peak growth at about age 12 and boys at about age 14, although each swimmer matures at an individual rate. If you find you're hitting a plateau, don't give up. Athletic events out of the pool may help you maintain your confidence, suggests USA Swimming. As you continue to mature, you take a greater part in your program by defining race goals, strategies and whether to add dry land workouts to your training regimen. Keep a base of aerobic fitness to ensure your time in the pool is rewarding and takes advantage of the technical base you've built. USA Swimming points out that swimmers who are the same age may actually differ by as much as five years in the developmental process. This means that two swimmers at puberty may have significant physical and emotional differences. A late maturer may be true to her age in terms of years, but lack the strength of a more developed teen swimmer. An early maturer will have to work to maintain skills throughout body changes sooner than a later developing peer. Can Swimming Build Broad Shoulders for Women?